I’ve suffered from anxiety and depression my whole adult life, but for some reason it never occurred to me that I would have PND&A. After several long years of trying we were blessed with twins via IVF. Parenting was nothing like I had envisaged, especially with twins. All I heard from people around me was how I must be over the moon and enjoying it. In truth, I felt trapped, and totally overwhelmed. It got to the point when the twins were 7 weeks old that I shut down and told my husband I couldn’t do it anymore. The next week I was in a mother baby unit. My medication was changed, and slowly I started to improve. It took me a really long time to recover. I made some amazing friends who were also going through the same as me, and having people understand me was so helpful. Six years later I was totally shocked to learn that I had fallen pregnant naturally. 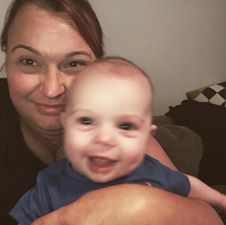 Two weeks after Finn was born I recognised myself falling into the depression and anxiety again, and once again returned to a mother baby unit to help me recover. When I came home I was informed about Peach Tree, and I started attending. It’s such a relief to be able to join women that understand, and be in a safe space to be honest with my feelings.